...The Pledge Moon looms over Purgatory before their demonic foe puts an end to the Earp line and humanity once and for all. Den of Geek Episodes 11 & 12 Review: Team Earp prevents the end of the world, but pays a steep price in the process. You guys owe me ten bucks. I totally owe you ten bucks and apology because I didn't think they would go there. And honestly, I'm not sure why they bothered because they already seemed to have about 3.5x more plot than they could actually film and smoosh onto the screen in these two episodes. I’m finding the ‘end every season on a giant cliffhanger’ format really frustrating & unsatisying. 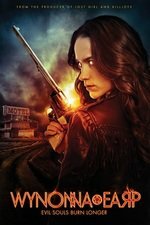 While SyFy has been decent enough to give the Killjoys team advance notice that their 5th season will be their last, there are plenty of other shows they have cancelled before their writers had a hope of wrapping things up. I’m sure they’ll find a way to rescue Waverly from the Garden, and get Doc back, but is Bobo dead-dead it just Bobo-dead? Overall the finale just left me feeling cheated.